The flagship store of makeup artist Jung Saem-mool’s cosmetics brand is like a sun-soaked garden of colors. Nestled in a corner of the trendy Garosu-gil in southeastern Seoul, the three-story building, opened in June, boasts white walls with multi-colored decorations. It’s like a palette, a playground where customers can fiddle with makeup to their hearts’ content, an employee there explains. On the store’s second floor, a library space stacked with beauty books and surrounded by plants, sits artist Jung, whose name has become synonymous with Korean beauty. She’s dressed in black but somehow still seems to exude a vibrant energy. Her hair is combed back in a chic ponytail, her signature red lips drawn on in dainty perfection. A pair of stylish black rims adorn her bare eyes (“I love eye makeup, but can’t wear any because my eyes are so sensitive!”) and her skin is clean and radiant, as usual. 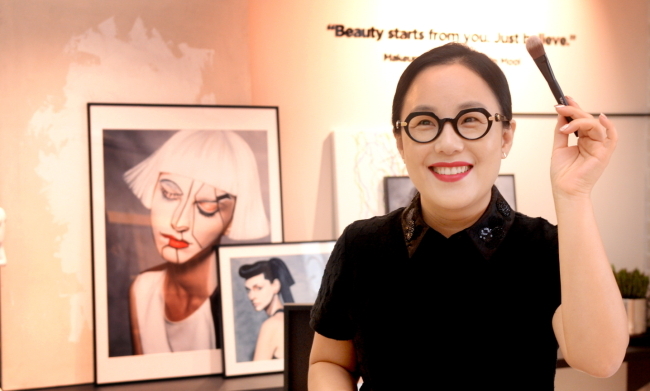 Though arguably Korea’s most well-known makeup expert, Jung had not realized how famous she was becoming abroad, the artist said. She had just returned from holiday with her family in Singapore when she met with The Korea Herald on July 12. “I was shopping at a clothing store. People recognized me. They said they had seen me on ‘Get It Beauty,’” she said, referring to a beauty program on which she intermittently stars. 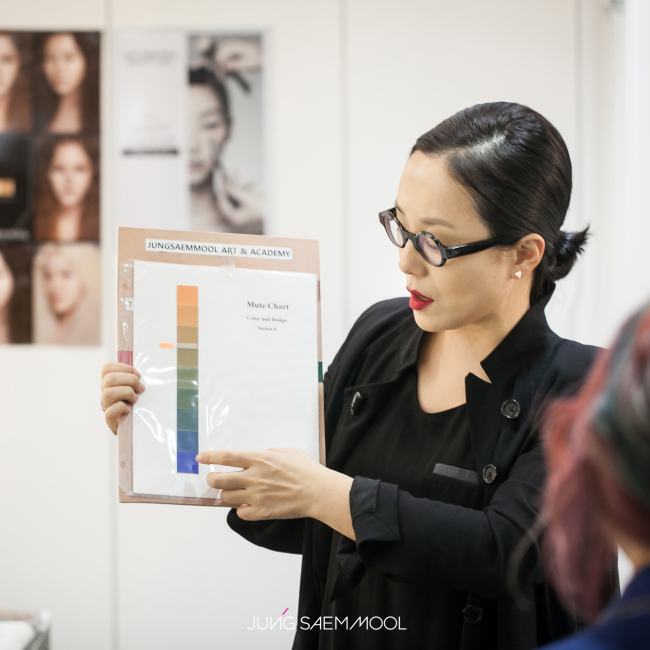 Since her debut as a makeup artist in 1991, Jung has risen to become the most sought-after figure among celebrities here for her attention to detail and knack for color coordination. As a rookie, she worked hungrily. Once, Jung pursued an actress client by studying her carefully and compiling a stylebook with looks that suited her unique image. Now, with a star-studded roster of clients that include K-pop singer BoA, Lee Hyo-ri and actress Kim Tae-hee, Jung and her method of creating flawless skin has become the trademark of K-beauty abroad. “We’re seeing more and more international students in our classes, from China, Hong Kong, Singapore, Indonesia and more,” said Jung. The students, most of them expert artists in their own countries, seek out Jung to learn how to make skin look as clean and “transparent” as the leads of popular K-dramas. But such effortless looks require tremendous effort and technique, Jung explains. The underlying philosophy is about “returning to a time when we were untainted and blemish-free,” she said. The now 47-year-old veteran artist says there’s still so much she wants to do. 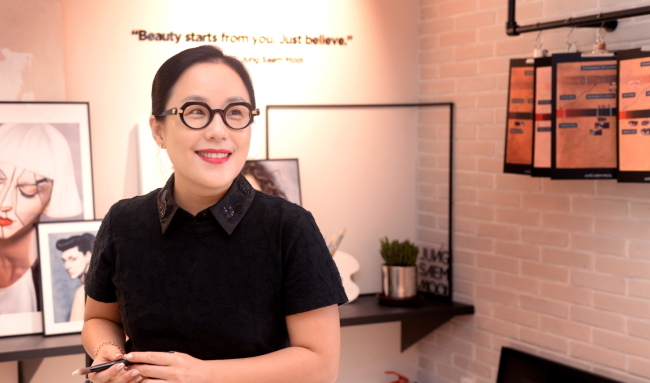 Aside from developing her eponymous cosmetics brand launched in 2015, raising a daughter, overseeing master classes at her makeup academy Jung Saem-mool Inspiration and weekly flying yoga sessions, Jung has been busy trying to spread her beauty philosophy in overseas lectures. Her theory on finding one’s personal color, which is based on the science of pigments and stresses the inherent beauty of each individual, has been met with enthusiasm from beauty experts abroad. Visible in the pupils of people with light brown eyes, such as actresses Lee Sung-kyung and Lee Young-ae, are yellow and purple -- colors that go well with bright shades like pastel coral, Jung explained. Darker brown pupils see a mix of red and green, and so on. Though people spend lengthy amounts of time looking in the mirror everyday, they rarely take the time to observe the lines and shapes of their facial features, Jung pointed out. “We need to take an interest in ourselves,” she explained. But Jung believes that beauty is more than vanity or striving toward certain standards. Trends can be stressful and fleeting, but fun if you know how to adjust them to your own looks, she said. Though seemingly tireless now, there was a period in her career when Jung was overwhelmed by it all. So she stayed in the Californian city for several more days, eventually falling in love with it and returning to study fine art at the Academy of Art University. During the four-year break, Jung, whose mother is also an artist, reveled in a sense of freedom that fine art brought. “The canvas is flat, so there’s much more scope for freedom,” she said. Now, Jung hopes to spread her technique of intricate, natural beauty, infused with a knowledge of fine art, as far and wide as she can.